Large wine jars, a cooking pot and other pottery vessels over 2000 years old were salvaged over the weekend in a complex operation from a cave on a cliff in a nature reserve near the northern border. 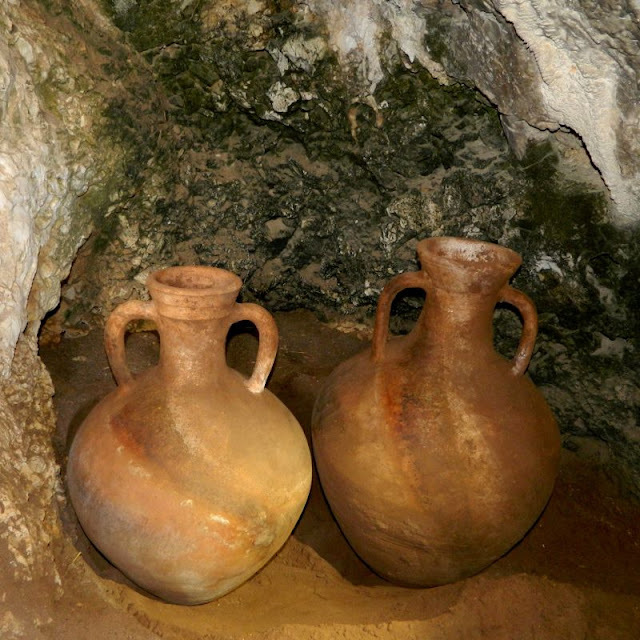 In 2017, Dr. Yinon Shivtiel, a speleologist and senior lecturer in Land of Israel Studies at the Zefat Academic College, conducted a survey in Western Galilee to locate caves that served as shelters and hiding places, aided by the Israel Nature and Parks Authority. 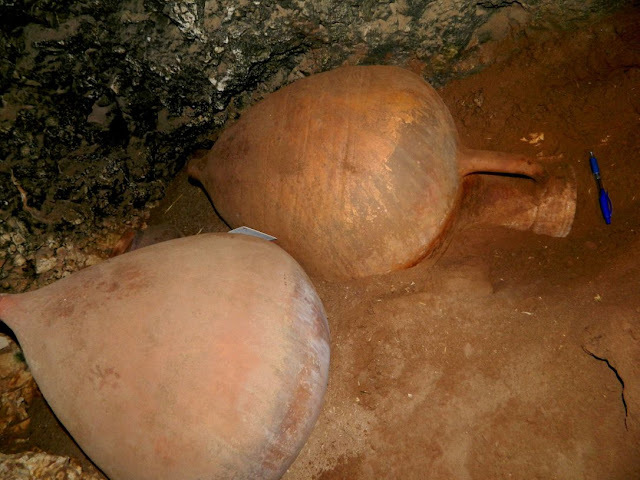 In the course of the survey he was surprised to discover a cave high on a sheer cliff, under an overhang, which contained ancient pottery vessels. 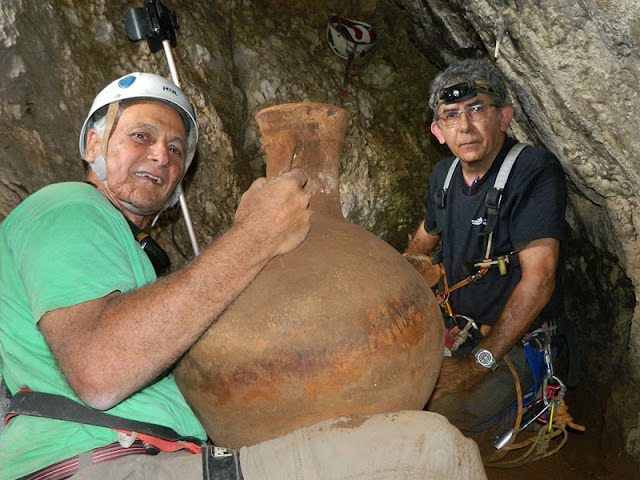 Last weekend Dr. Danny Syon, senior archaeologist with the Israel Antiquities Authority joined Dr. Shivtiel to carry out an archaeological excavation of the cave and salvage the vessels so that they can be studied. The salvage of the fragile 2000 year old finds was made possible by the cooperation of Vladimir Boslov and Boaz Langford of the Israel Cave Research Center of the Hebrew University in Jerusalem as well as volunteers from the Israel Cave Explorers Club. Due to the proximity of the cave to the Lebanon border, the operation was coordinated with the IDF, which extended generous help. 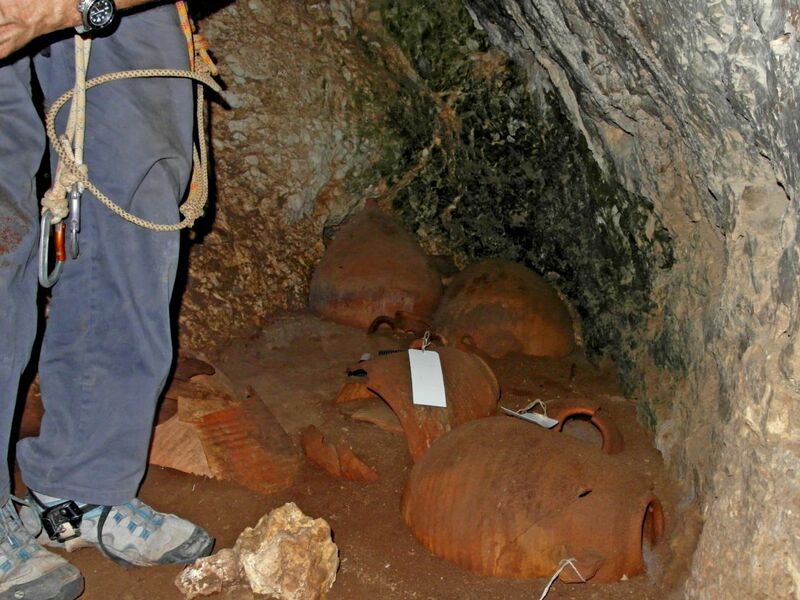 The excavation was carried out under a permit from the Israel Nature and Parks Authority. The excavators climbed up ropes into the cave and in a coordinated and strenuous effort in a confined space succeeded in carrying out an archaeological excavation, in the course of which two intact wine amphoras (jars), several storage jars, a bowl, a cooking pot, two juglets and broken shards of several more jars were dug out. The fragile vessels were wrapped in a protective plastic sheet and were lowered in padded bags some 30m over rope slides controlled from below and reached the base of the cliff safely. The team carried the finds on foot to the cars and they were taken to an Israel Antiquities Authority facility for restoration and research.